I annotated my VCF with SnpEff, whether they are missense variants, intron variants, and so on. Now I want to know how many variants of each different type I have. I don't know exactly how to do this because each variant may have (and often has) several functions (usually corresponding to several overlapping genes, as far as I understand). Considering this, how would one usually go about counting the number of variants of each functional type? I don't know exactly how to do this because each variant may have (and often has) several functions (usually corresponding to several overlapping genes, as far as I understand). Any given variant can indeed overlap multiple genes that may, for example, share the same promoter; however, each variant can also have different functionality within the same gene's transcript isoforms. A variant can be exonic in one isoform, for example, but intronic or splicing in another. I see, thank you. 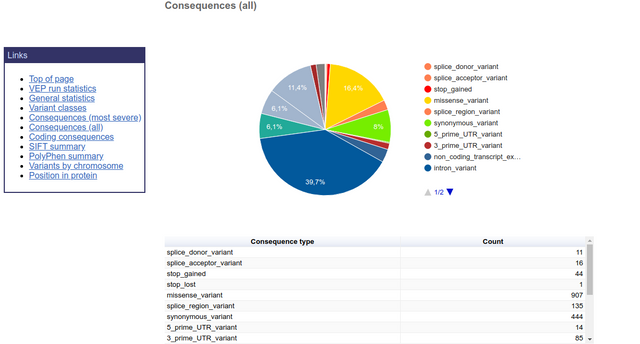 I wonder, though, if SnpEff counts all annotations of all variants or just the first one in the list (which is sorted by impact in decreasing order). It appears to be an accumulation of all noted annotations. The author attempts to explain it on the page to which I linked you (above), but it's not something that is easy to explain! The easiest way to test this is to just annotate a handful of variants in your VCF, and then manually check the annotated stats / results. Plot number of mutations in each cancer type in VCF files?